This elegant, fresh and new 2013 Lagoon 400 is guaranteed to give you a sail of a lifetime. 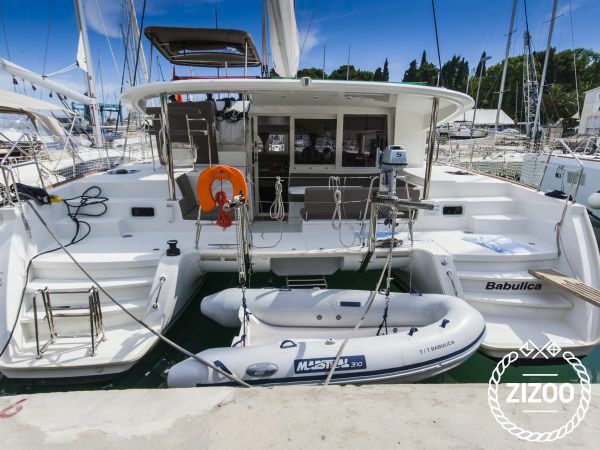 Based in the Croatian hotspot Split, The Babulica is made for an exciting family or group vacation. It's sleek design and comfortable space sleeps up to ten in 4 cabins. The salon is open and spacious making it a great place to hangout and enjoy Croatian seafood and delicacies. On deck there is plenty of space to spread out your towel and soak in some sunshine. Sail out to Croatian favorites such as the Islands of Brac and Hvar, or discover the historic towns of Sibenik and Trogir. Don't forget to head down to Makarska, and enjoy its sandy beaches, pine tree lined walkways and gastronomic havens. Make Croatia your destination of choice and discover its natural untouched beauty behind the sails of The Babulica. And rest assured you have an experienced and knowledgeable crew to answer all your sailing needs.